Executive Functioning just went digital! Check out: MyHomework App for Productivity and Organization. My Homework App for productivity and organization. This has been cross posted on the Giant EdTech Blog. Now that we are beyond the first few days of school, chances are pretty good that teachers have already given assignments and some students have already missed turning them in. I’m not trying to be negative, I just know realistically that it can be a big shift for many of our kids to keep track of due dates and expectations for multiple classes throughout the day. In addition, for many students a lack of executive functioning is the one thing standing in the way of their success in the classroom. I believe it is our job as teachers to not just teach content, but to help teach students how to learn, which includes organization, time management, and study skills. Even at the high school level, we cannot assume our students are ready to independently manage everything that comes their way. 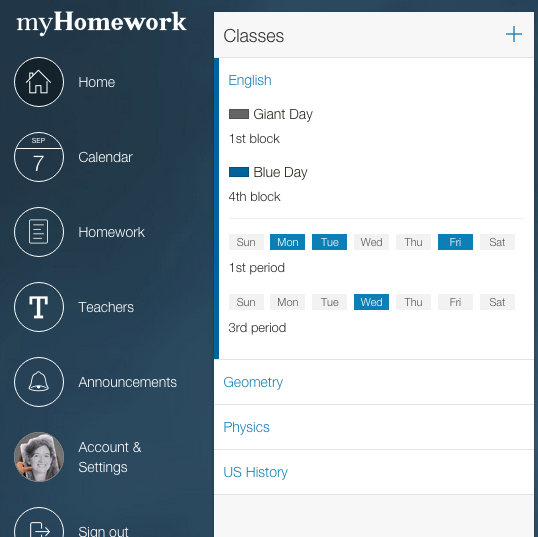 That’s why I’m excited to introduce you to MyHomework App. This app is available for Chrome, iOS, GooglePlay, Android, Mac, Windows, KindleFire, and just about any other system your device could possibly use. The versatility of this app makes it possible to sync to multiple devices which gives students options and allows for them to take ownership of their management system. This app is designed to replace the traditional student planner to help students stay on top of their assignments on their device of choice. It has several attractive features such as the ability to manage students’ schedules by class period, by time, or by block. Students can set the priority level (low, medium, high) and can even set reminders which will pop up and let the students know that they have an assignment due soon. You can find MyHomework App in the Chrome Web Store. Once you have added it to your bank of Chrome apps, it will prompt you to create a log in. You can sign in with Google, which makes it one less password you need to remember. Once students sign in, they will be prompted to add their classes and indicate how they want to organize their schedule and color code their classes. You can always go back and edit or customize these settings. The plus sign in the corner allows you to create a new class. 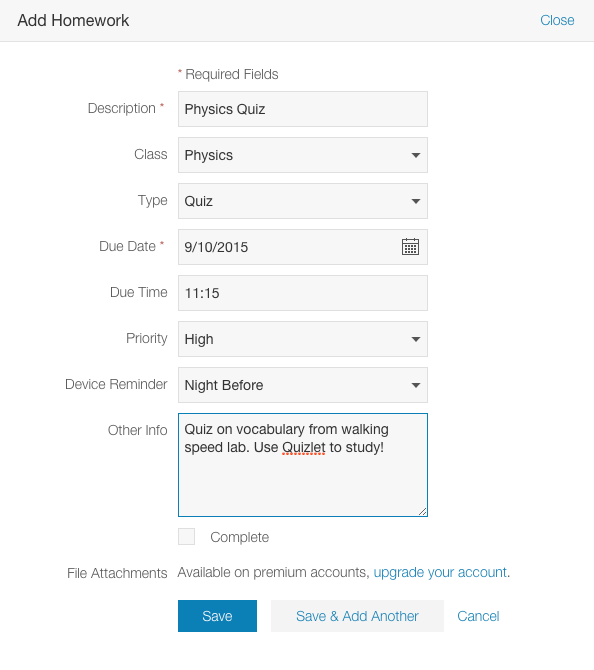 Once students have their classes set up, they can add assignments. In the example shown here, I added a physics quiz. I was able to set the priority level to high and I also set the device reminder to pop up the night before so I will remember to prepare for the quiz. There is also a text box to add other info. that might help clarify the assignment. Students can mark when assignments are complete and are able to track their classes. They can also earn “rewards” through a 3rd party advertising site called Kiip. MyHomework states that ads and rewards are family friendly and may include movie tickets, and snacks. You can purchase an upgraded account for $4.99 per year which will remove all ads and give a more robust tracker.MyHomework App also works in concert with Teachers.io which allows teachers to input assignments if you have an entire class using the app. There are many digital options out there to assist students with planning, scheduling, and organization. What are your favorites? Go ahead and post your suggestions below. Director of Instructional Technology and veteran special education teacher. Passionate about finding ways to benefit all learners. Google Education Certified Innovator and Trainer. Presenter, consultant, leader of change and innovation. Administrators: Do You Know Where You Live? Teachers- Here is your (digital) back to school survival tool kit for a fantastic year. What We Really Mean When We Say “What’s Best For Kids” And Some Alternatives For Your Next Meeting.